We have been traveling for three weeks in Andalucia, exploring the grandness of history here. We've enjoyed the kindness of people and been fascinated by the history and monuments. 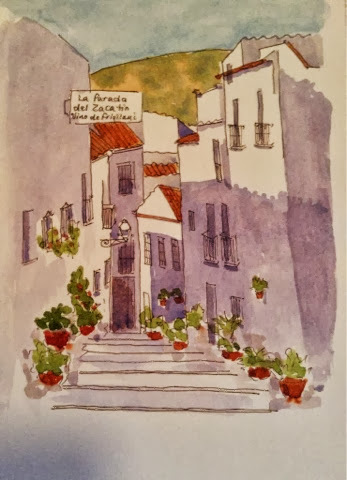 Our last few days have been on the Costa del Sol, where the white villages glow with the light.This is a sketch of a shady calle in Frigiliana, a tiny but very old village about 10 kilometers above the sea.